Performances at the Lir on Pearse Street, Dublin, from Friday 1st December until Thursday 7th December, at 7.30pm. Matinee: Monday 4th December, 1pm. The dark dramas of violent jealousy, sexual slander and death at the court of Sicilia, lead to a small baby girl being abandoned in the wild reaches of rural Bohemia. There, sixteen years later, the hot midsummer festivities are the background for delight, disguise and denunciation, which in turn carry the tale, replete with runaway lovers, a scalliwag, an old shepherd and his clown son back to Sicilia. The icy mourning of King Leontes begins to thaw as these two contrasting worlds meld, and in a magical finale full of revelations, Shakespeare shows us his delight in such a vivid, motley collection of characters and his ultimate belief in forgiveness and redemption. For more information on the production and to book tickets, see the Lir website here. Call for papers for Borderlines XXII: Sickness, Strife, and Suffering. This conference will be held from 13-15th April 2018 at Queen’s University Belfast. Proposals for both papers and panels are welcomed from postgraduate and postdoctoral researchers in the fields of both Medieval and Early Modern studies. Sickness, strife and suffering punctuate many medieval and early-modern narratives. When viewed by the modern eye, however, these experiences can be difficult to comprehend and empathise with, without resorting to anachronisms. Indeed, in her landmark treatise on pain, Elaine Scarry contests that ‘[p]hysical pain does not simply resist language but actively destroys it’ (Scarry, 1985: 4), thus rendering any description or explanation of pain practically impossible, regardless of era. In the light of Scarry’s work, the specific difficulties posed by the expression and understanding of pain in the Middle Ages have been expounded upon and theorised by numerous scholars. Esther Cohen’s work on the various symbolisms of medieval pain (Cohen, 2010), in addition to Robert Mills’ adumbration of translative pain theories, mapping the medieval experience of pain onto that of the current day and vice versa (Mills, 2005), are just two examples of scholarship exploring this fascinating area of research connecting the human experience of the present with that of the past. Please send all abstracts (along with a short academic biography) to borderlinesxxii@gmail.com by 5th February 2018. The famous author and Dean of St Patrick’s Cathedral was born 350 years ago this year. Best known for his satirical works, including Gulliver’s Travels, Swift was also a noted champion of liberty and freedom of thought and advanced a number of social causes. His legacy to the city is profound, both in a celebrated body of work and in a number of institutions which he founded and endowed, including St Patrick’s Hospital on Bow Lane. Check out details of the Festival at www.jonathanswiftfestival.ie. 26th November: Swift’s Food – a sumptuous and unique dining experience in the nave of St Patrick’s Cathedral featuring food of the later 17th century – starts 7:30pm. 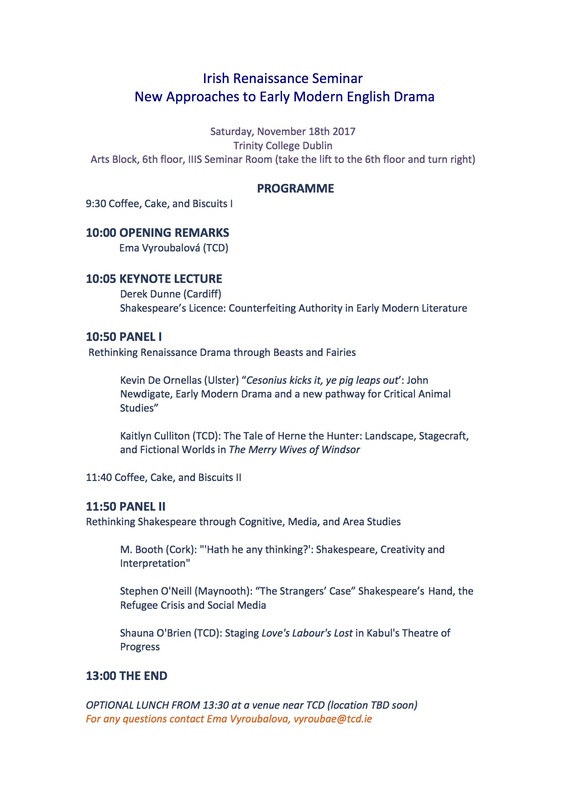 The next biannual meeting of the Irish Renaissance Seminar will be held at Trinity College Dublin on Saturday, 18 November 2017 at 1–4.30pm. Full details will be posted shortly! 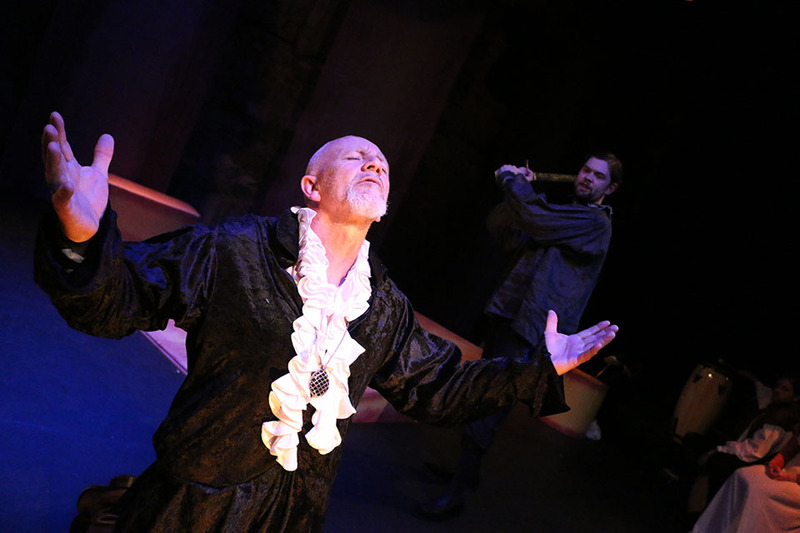 The Gaiety School of Acting Shakespeare Schools Programme presents King Lear. A run at Dean Crowe theatre in Athlone has already been completed, with dates remaining in Cork and Dublin cities at Firkin Crane and Smock Alley theatres respectively. The Gaiety School of Acting – The National Theatre School of Ireland is offering Leaving Cert. students a unique opportunity. The Gaiety School of Acting is delighted to launch our 2017 production of King Lear. This production will travel to Smock Alley Theatre, Dublin, Firkin Crane, Cork and The Dean Crowe Theatre, Athlone from the 23rd of October to the 1st December. This is the 5th year of our Shakespeare Schools programme and in 2016 we performed Hamlet for almost 6500 students from 130 schools. This means that almost 1 in every 9 students sitting their leaving Certificate English exams in June will have seen our production. We are excited to once again provide students with the opportunity to see Shakespeare’s work live. Traditional Production of King Lear (1.5 Hours). Student Workbook with information on General Vision and Viewpoint, Social Settings, Characters and Theatrical information. Pre show video for your students which will introduce them to the play, its literary genre and the cultural context.